I made this post with Millya’s paperdoll image in it ages ago. Here’s the image, anyway, if you don’t want to click over there. 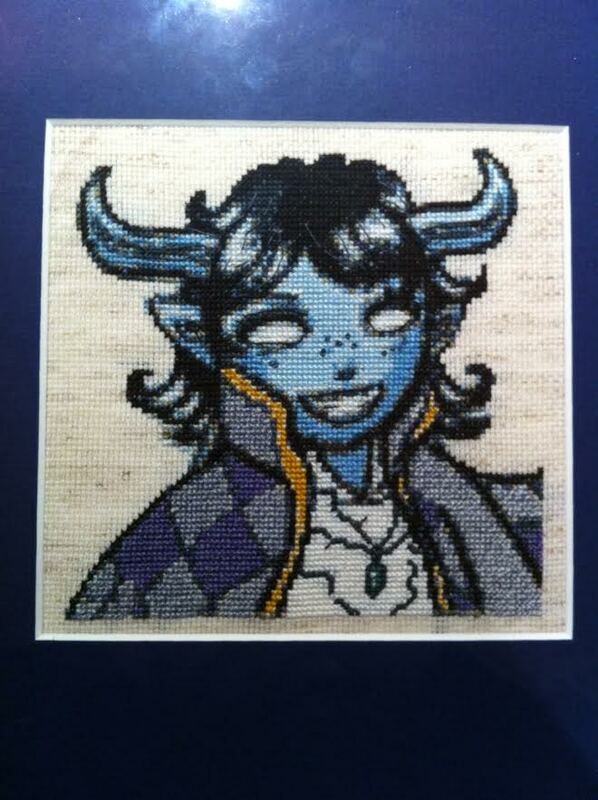 It is a cross stitched MILLYA. AS HOWL. Be still, my heart! Upon opening the card it was revealed that my Santa was the very talented @Kialesse from Twitter. Needless to say, I love it and I am so impressed. She even had it matted and framed up so that I can pop it right on the wall. I’ll do that as soon as I decide where. I’m thinking pride of place right above my computer monitor so I can look at it often. So that is the story of the SS gift I consider myself very fortunate to have received. Well worth the wait! Especially after delivery snafus. Apparently UPS put the package on my doorstep last night, but I didn’t know until this morning and poor Kia was freaking out. I’m really glad it was there, it would’ve been too awful if something had happened to it. Who knew they delivered things that late!? Anyway, crisis averted. Draenei delivered. The wrapping paper was even a sort of shiny draenic purple, haha. This is the first archived RP I have “fictionized.” It takes place as much of our RP did, during the Wrath era – before the Lich King was defeated. It starts around the time of Ulduar. I hope it reads okay, due to the back-and-forth nature of RP most of these will be pretty dialogue heavy but I’ve tried to smooth them out with more in-between things when necessary. We occasionally used in-game friends as casually mentioned “extras” (i.e. mention of a rogue included an actual rogue) which some people might recognize but I’ve removed any such names because those people didn’t agree to be part of fiction we were writing. Late afternoon sun streams in the windows of The Legerdemain Lounge in Dalaran. The low hum of conversation in many different languages carries through the open space. It’s not full to bursting with patrons, but a number of people occupy different scattered tables. At one of these sits an aqua-skinned draenei woman. She is hunched forward with one elbow on the table, the sleeves of her violet robes are pushed past her forearms. Beside her is a small pile of books haphazardly stacked, a half empty cup of tea, and a plate with a few crumbs on it. The last book seems to have been set aside in some disgust, a keen observer might note, as it reached the other end of the table before sliding to a halt. No books open now, she idly watches the crowd. Her eyes stray now and again to the elf who is tending bar, as if she’s keeping an eye on him. She notes with interest when a new customer enters the establishment, one of her own people, unusual for the fact that he is wearing heavy armour in stark contrast to the more casually dressed crowd. The woman watches as the other draenei strides noisily up to the bartender and orders an ale. He sits on a stool at the bar and she can almost hear its protest as it groans under the weight of a fully-armoured male draenei. She purses her lips in a considering fashion. He looks familiar. Especially when he sits down and she sees the back of his head, she thinks that she might know this man. She glares at her discarded book for a moment, then goes to take a sip of her tea. Finding it stone cold, she takes the opportunity to walk up to the bar herself. The male draenei has not noticed her, his attention inevitably drawn to a table of three orcs sitting not far away. As she reaches the bar he says something loudly in Orcish. Definitely loud enough for the three orcs to hear: they turn as one to glare at him menacingly. The draenei warrior stands up from the stool, hand going to his scabbard as he and the orcs stare at each other. After a moment, one of the orcs says something that sounds insulting and they all head towards the door. The draenei woman nods pleasantly to the bartender, who takes her cup and hands her a fresh one wordlessly – as if they’ve performed this same exchange many times before, possibly many times today alone. Turning to the burly draenei who has resettled his alarming bulk onto the beleaguered stool, she says in Draenei, “Three to one? Not good odds, assuming you didn’t exactly invite them to enjoy their beverages and have a good afternoon. I never did get the hang of Orcish myself. Too guttural.” She gestures at her throat with a shrug. He turns around quickly and then relaxes when he sees the dark-haired mage, recognition lighting in his eyes. “A minor disagreement, that’s all,” he assures her. He lets out a hearty laugh, leaning back and grabbing his tankard. “Something like that, yes! It’s a pleasure to see you without the stench of battle all around. It’s, hmm…Millya, right?” Even as he speaks to her, his eyes roam the room, keeping an eye on the surroundings. She furrows her brow. “Well, the long and short of it is that I’m trying to figure out the fastest way to apply a lethal blast of magic. It’s an efficiency thing, I suppose. There’s this smarmy little human who keeps stabbing things before my spells ever get there. Highly inefficient, such a waste. And so messy – her, that is.” She pauses and sips her tea again. She sips her tea thoughtfully and nods. “They make powerful allies. And powerful enemies.” After a moment, she adds, “You know…you don’t really sound like someone who gets hit in the head for a living.” The other draenei chuckles and takes a sip of his beer. He nods and sketches a short, soldierly bow in her direction. “And you, Millya. I am looking forward to stumbling upon your reading again.” He leaves some coins on the counter for the barkeep and leaves. Millya could swear as she resumes her seat at the table that she can hear the distant sounds of a scuffle somewhere outside – the clash of metal and indistinct shouts, but she shrugs it off. It’s probably just her imagination. 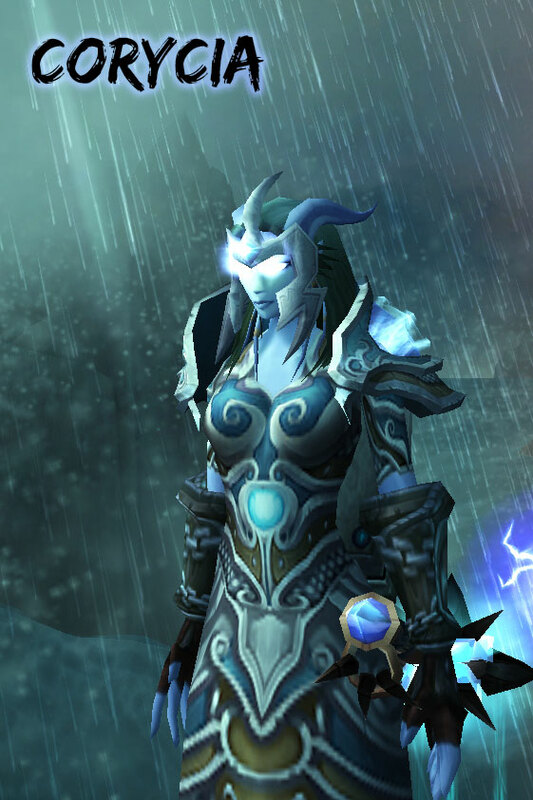 If you’ve read my blog pretty much at all, then you know how I feel about draenei. I have many reasons, though I feel that it was articulated best by my coworker Matthew Rossi. I just love them. 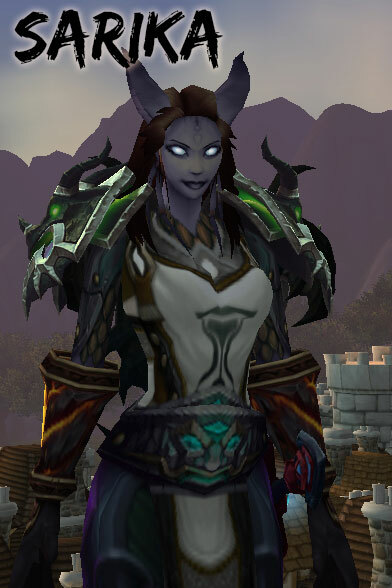 I was joking with Rades the other day that I have a definite draenei bias. I feel a kinship with other people who identify with these strange, unique travelers. The past few months I’ve been on a leveling kick as I wanted to get the “five different classes at level 90” achievement. As more of my characters got to 90, I realized something. 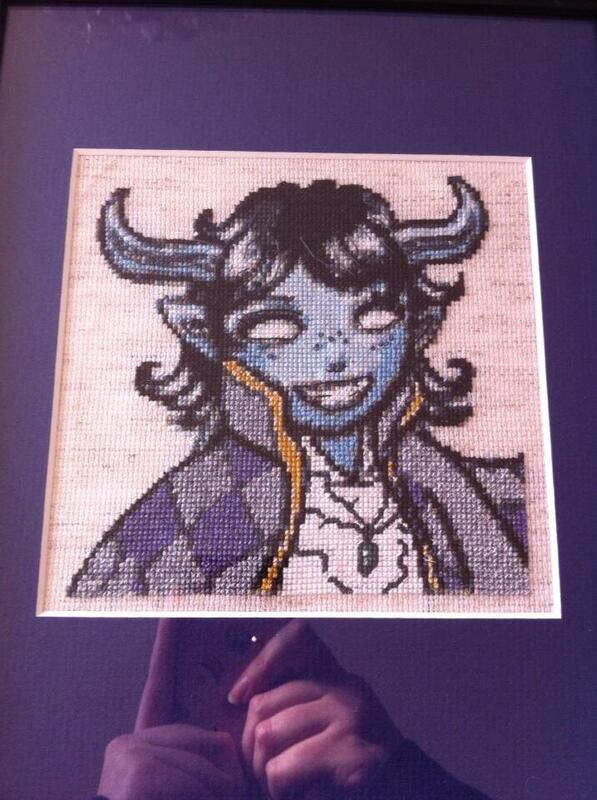 I want a complete set of draenei. One of every available class at level 90. I’m already halfway there (and close on a few). This wasn’t necessarily by design, it’s just that every character I have that can be a draenei is one. Let me introduce you to my ladies. Pretty well-known around these parts. My tea drinking, fireball slinging scholar, Millya. She is my main-main. She’s also the best dressed. Because I’ve spent so much time gathering clothes for her. Heck, I made her a paperdoll. She’s been playing “World of Dresscraft” since I first created her. She is a conjurer of cakes and destroyer of bad guys. She’s already level 90, obviously. If Millya is my primary main, Vid is a strong second. I don’t know what it is about people who like mages, but we also seem to like holy paladins. I don’t have any statistical proof here, except that many people I know who play either holy paladins or mages as their main characters often enjoy the opposite class as an alt. Vid of course is the character in From Draenor With Love. She’s a military brat with a strong interest in engineering, particularly things that fly. I’m currently working my way (slowly) through the legendary quest chain to get her a fancy cloak for no real reason since all she does is LFR. 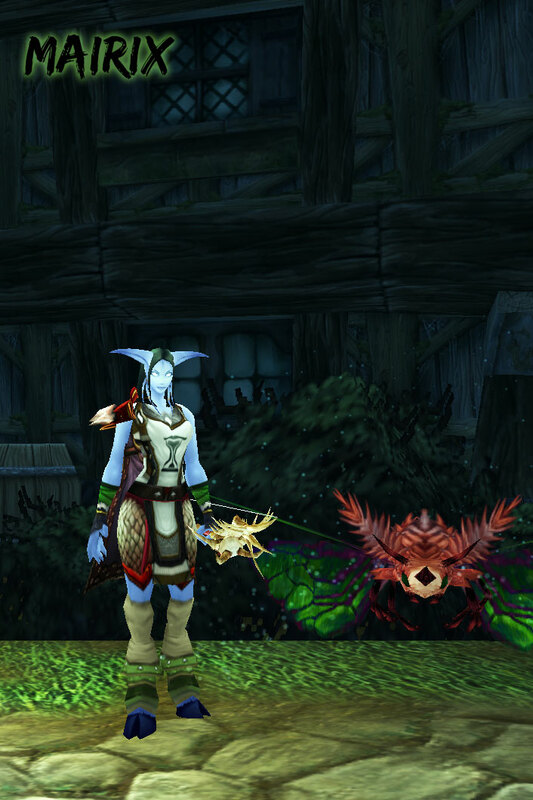 Okay, I admit it – I like the way the cloak proc looks for healers. My newest 90, a young upstart that stole my heart. I started leveling a monk for Business Time’s Stay Classy achievement and made her a Brewmaster on a friend’s suggestion. I didn’t know how much I was going to love Brewmaster. 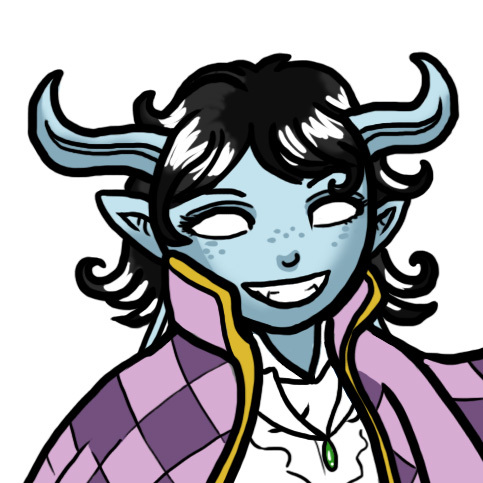 I have a rough idea in my head that Jun was an initiate of the Auchenai but was one of many young draenei that left when things started to get weird. She despaired of ever completing her training and led a quiet life thereafter, abandoning notions of being a monk. She was working on the Exodar when she heard of this new continent and the Pandaren monastic traditions. While being a brewmaster as such struck her as a bit unorthodox, she was determined to learn whatever the monks had to teach her and made it her mission to get to Pandaria. I tanked with her all the way along – even for pugs – and had a blast. Unfortunately she has stalled a bit at 90. I’m not sure what the future holds for her, as I don’t want to tank LFR or anything like that. 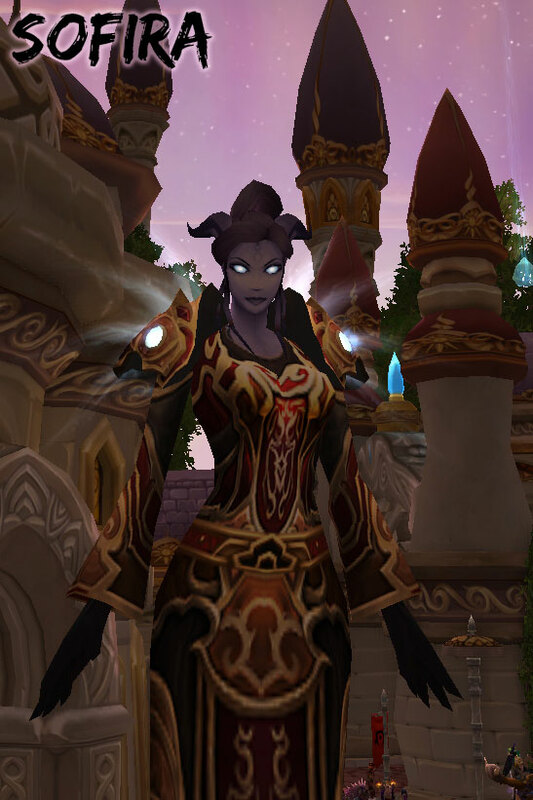 I might go solo old content for transmog gear – leather wearing draenei! 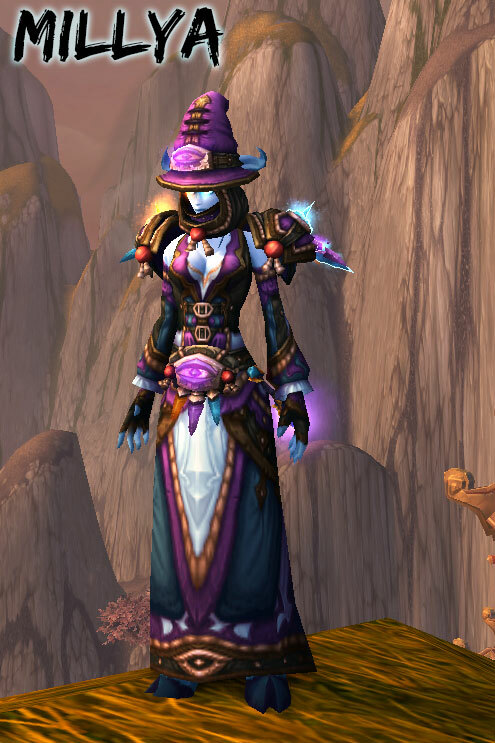 Just putting together a transmog for her as she leveled was a blast. Sarika, much like the rest of my draenei at this point, doesn’t have much of a story to her. She’s level 85 and I’m dreading leveling her to 90 because I haven’t played a warrior in ages and really don’t know what I’m doing. I think she has a rough and tumble demeanor, though. She’s kind of a mercenary or sword-for-hire, without strong allegiance to any person or faction. I’ve got her on hold for a bit until I feel ready to quest through Pandaria again. Corycia was a character I did roleplay a little bit at one time with a friend. Her name was different then but it was the same character. She’s not very fleshed out, though. She was my Herald of the Titans character! She also has art of her. It’s funny, when I did the art it was because I thought it was the only way she’d ever get to “wear” the shaman set you see her wearing above (I think it’s T6?). 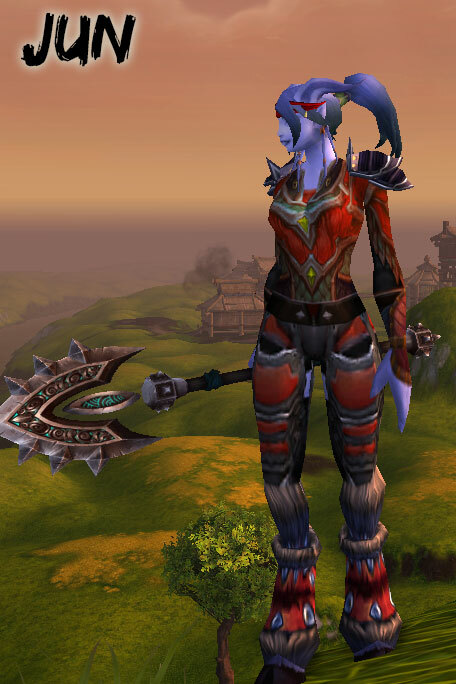 Little did I know that after Wrath it would be easy to go back and farm it up for her, and transmog lets her wear it! I love that set. She is currently leveling through Cataclysm content. My little hunter and her moth, Grimnebulin. She doesn’t have any other pets yet. Playing a hunter is surprisingly fun, I benched her ages ago (before focus was a thing, that’s how long ago) and haven’t played her since until recently. She’s obviously got the longest way to go before she’s 90, but I’m told that hunters practically level themselves. She does seem to kill things pretty quickly. So that’s all of my draenei – I have 4 level 90s, an 85, an 82, a 59, and a 23. My deadline for myself is I’d like to have them all at 90 before Warlords drops. I think that’s pretty doable, considering that two of the four that need leveling are already 80+. Death Knights thankfully start at 55 and hunters are pretty quick, so I think I can get it done! Maybe along the way I will try to think of more story for the characters that don’t really have one, or maybe not, I’m not sure. It’s a fun little side-project, anyhow. I’ve known people who wanted all of the races of a particular class, or one of each class, etc. This seems like a fitting way to pay tribute to my favourite behooved race. Incidentally, Warlords fever has hit Azeroth. 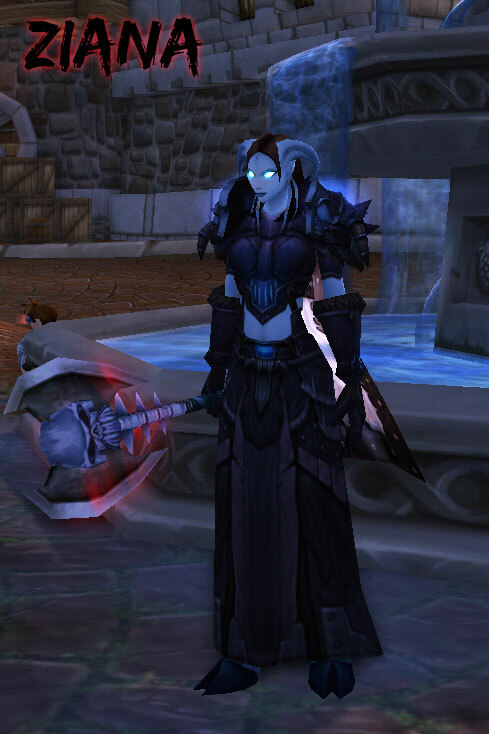 Ever since WoD was announced, when I’m leveling alts nine times out of ten the other characters I see are draenei. Everybody wants a draenei for heading back to Draenor! 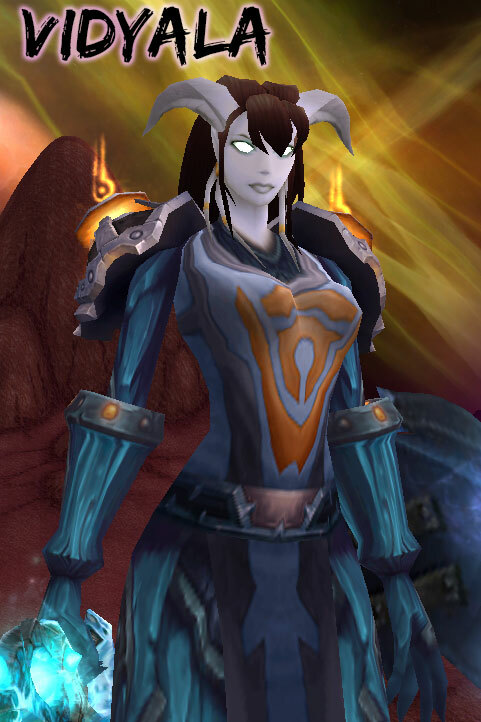 Some of you might remember that I created Vidyala (the actual paladin character), around December 2009. She was created with a purpose; to be “the pugging pally,” and I created a blog of the same name. LFD was very new then and I wanted to see if you could level a character entirely using the dungeon finder. It was the first opportunity to level a purely healing character. Of course, this is nothing remarkable now and many people level characters using exclusively LFD or some combination of LFD, PvP, and questing. At the time it was somewhat noteworthy, though, and my blog gained a certain amount of notoriety as a result. In 2009, we had recently joined Business Time on Moonrunner, leaving behind our RP server roots for a more progressed guild and a PvE server. It was something of a culture shock. I also really missed roleplaying. I started roleplaying again, mostly with Vosskah. Initially, we primarily played both of our main characters – for him, the warrior and his namesake, Vosskah, and me my fiery tempered mage, Millya. Some time in 2010, I began to flesh out Vidyala’s story as well and she also saw some RP. I was happy playing these characters that mostly had no connection to anything from the past, we started absolutely fresh with them. I wrote quite a bit of short fiction and we RPed a lot (primarily using IMs). The other day I realized that because of the format of our RP, all of it is saved in my chat history. I like IM roleplay for a variety of reasons – it’s completely private so you can’t get anyone griefing you, you aren’t limited to emotes and /say, you can be in any location that you wish and have more control over the world around you. Of course, it has its downsides – you won’t meet any new people, you don’t have the world actually existing around you. But for the most part it was okay, and we’d done a lot of it though it had drastically dropped off to nothing during Cataclysm. I lost my connection to the story sometime during Cataclysm. But we had all of that RP from before, and I began the arduous task of compiling it into a single document, chronologically. I included any short fiction and interspersed it with the RP. At the end of it, I have a document that is 430 pages, single-spaced. It’s 278,664 words. That’s about 5 NaNoWriMos! It’s a lot of words. Some of it is the story of Millya and Voss, with a bit of my night elf druid, Shae, mixed in. Some of it is the story of Vid and…well, this is the part where it gets complicated. Most of this writing was done between 2009 and 2011. At the end of 2011, I started collaborating on From Draenor With Love with my good friend, Rades. It started out as a gag type strip, primarily featuring our two characters, Vid and Rades. They were a natural choice (though neither of us raids with them in-game) because they were both engineers and we thought they could have met and become friends. Not everyone liked our casual adoption of this plotline (“You’re breaking the lore!”) was probably my favourite comment from that time period. But it sort of didn’t matter because the strip WAS generally one-offs, we never delved very deeply into the actual story of Vid and Rades. But fast forward to 2013, when we decided to make a drastic change to the format. The strip gained continuity and an ongoing storyline that we have pretty well planned out. The dilemma for me is that the story of From Draenor With Love departs pretty drastically from the Vidyala I know (and continue to write about in my own stories). I’ve had a few questions about this, because some people know parts of those stories. I wrote a very brief story here on Manalicious back in 2012 that makes the relationships of some of the characters very plain. Vosskah is Vid’s father. Millya is Vid’s stepmother. Vid is actually in a relationship as well. But here’s the thing: almost none of this is true in the FDWL continuity. In FDWL Vid doesn’t even know Millya. Much to the “real” Vosskah’s outrage, her father is dead. It’s creating some weird cognitive dissonance for me as I try to keep the two separate in my mind. Rades must have free reign to write the story of FDWL as he sees fit (and trust me, if I may be so bold, it’s a good one! At least I like it). But that other Vid didn’t cease to exist. When I write and RP now she’s still doing her thing. Actually her relationship with her father has been really important to her character. FDWL Vid doesn’t have that relationship at all. There are other parallels between the stories that I won’t expand on in any depth (spoilers…). I know it’s confusing for readers as well, because while FDWL was a gag strip we used Vid and Millya interchangeably depending on the joke, never really explaining the connection between the characters or even if they had any. They were both shorthand for “me,” as in real-life me. Someone actually asked in a comment on FDWL recently when or whether Millya would show up. The answer is she probably won’t, because she has no place in Vid’s FDWL continuity. But you have to understand, I love Millya, and Vid, and all the characters and stories that are rattling around inside my head. You’ll notice that I’ve commissioned or exchanged more art of Millya than anyone else. Just because she wasn’t the best fit for sharing stories with Rades doesn’t mean she doesn’t have a story. All of which is a roundabout way of saying, I might write and share more fiction here on Manalicious. I know that’s not everyone’s cup of tea so I will make sure to label it very clearly and if you don’t want to read that – by all means skip it and you won’t offend me at all. I’m probably going to start by trying to revamp, edit and rewrite some existing RP and stories so that they will read smoothly and hopefully be interesting. I’m kind of shy about posting fiction at all, but I’m trying not to worry about it because I think Manalicious has a pretty small audience these days anyway. This is also understandable because for a long time I wrote here very seldom. Now that I’m getting a handle on the WoW Insider thing as well as the time FDWL takes, I find myself with more of an urge to use this space for things that are a bit more personal. I wanted to write this intro entry to the fiction, though, to make it absolutely clear that anything written here has NO bearing whatsoever on the story of From Draenor With Love. None of it is canonical as far as those characters or their adventures are concerned. Yes, Vid and Vid II are the same person and it overlaps in places but it’s like there is a split. This Vid exists (when I get to her stories) and that Vid exists, and never the twain shall meet. I’m not even sure if “my” universe Vid even met Rades. (I know, my previous fiction with Millya and Vid specifically states that she did). It’s all a bit confusing so there may be contradictions like that. I’ll do my best, though. I sometimes whine about missing being on an RP server (enough that my friends are probably sick of it) but I’m just not sure I have the time to devote myself to playing on a server other than my main one often enough to meet people and be a presence. This is something I can do on my own time though and so I’ll give it a shot here. I should also mention that I owe a debt of gratitude to my husband, Voss, who agreed to let me share some of our stories with a wider audience. At least half of any given story is his and I’m going to edit them very respectfully to stay true to the spirit of his characters as well.